A band-pass filter for 80 meter band. The simple direct conversion receiver I built a while ago works great when used daytime but on the evenings it will get overloaded by broadcasters. Maybe I can cure that with a better Band-pass filter. So I built one. I used the values that I found at W8DIZ site, but with some variation to fit what I had in the junk box. As you can see it is built 'ugly' on a PCB. I am using SMA connectors as I was able to buy a large number that probably will last for many years to come. A long time since last entry in this blog. A summer with vacation and nice weather is now behind us. Some radio activity also and other news to mention. Portable: I have been portable a few times during the summer. I have been participating in the Swedish Flora and Fauna activity. If you activate a Nature Reserve you might get a pile up on you which I now have tried for the first time. I also realized this summer that this contest and dx chasing part of this hobby is not a thing that I find important. It is the technical things and building stuff that is fun! But being portable has of course been a good time to try new antennas. I have built a few and I hope to write about them in later blog posts. Mini VNA Pro: I got a really nice birthday present some months ago, the Mini VNA Pro. 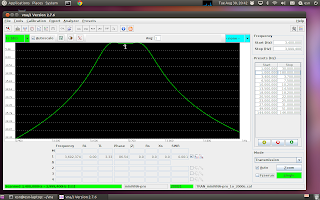 An instrument that can measure on antennas, filters etc. The good thing with this one compared to other offerings is that I can use the VNA/J software in Linux. Others: I have a few projects running now, like some more SDRs and maybe some rx / trx, but still not enough to tell anything about. I also play around with the Atmel AVR microprocessors, that is fun!